When customers receive an NPS survey, they’ll respond to the: “How likely are you to recommend…?” question by selecting a score on a scale of 0-10. Promoters (9-10): A promoter will go out of their way to recommend your product or service, often unprompted. They are willing to put their personal reputation on the line for it. Passives (7-8): A passive probably liked your product or service, but it wasn’t a slam dunk. They may mention it in the right context, but they are unlikely to personally vouch for it. Detractors (0-6): A detractor will proactively take any opportunity to dissuade people from using your product or service. They often speak louder than promoters. 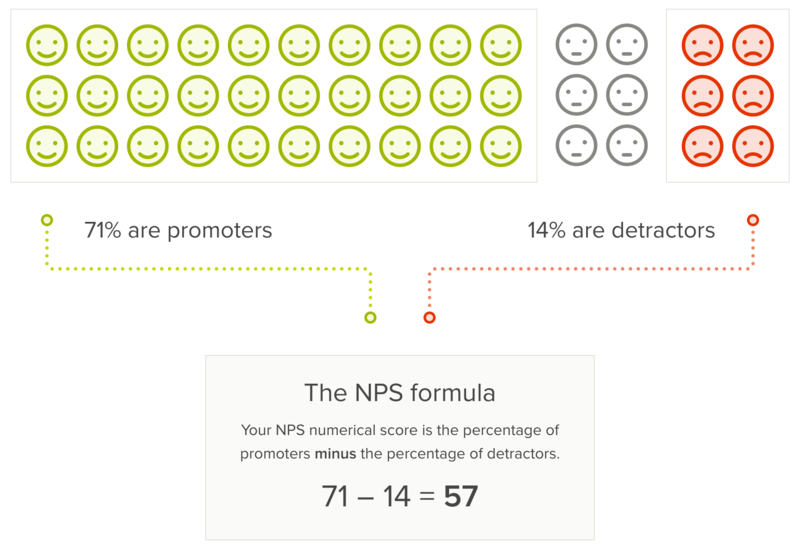 Wondering how your company’s NPS is calculated? NPS is simply the percentage of responses that are promoters less the percentage of responses that are detractors. What are some common scores? When reviewing benchmarks for NPS, anything above 40 is considered a solid positive score. A score above 50 would be an extremely positive score. Scores above 65 are typically the milestone where organic growth starts developing very rapidly. Scores above 70 are rare, only a few of our customers maintain NPS at that level. Looking to see how your score compares to others? Explore average Net Promoter Scores in different industries, as well as compare your own score, via Delighted's NPS Benchmark page. With a strong understanding of the NPS methodology, you’re ready to dive into your Delighted dashboard! The next section will cover some key areas of your dashboard that you can explore to get the most out of Delighted and customer feedback.